The birthstone for Virgo is the Sapphire. The Zodiac sign of Virgo also responds to Carnelian, Zircon, Jade, Jasper and Agate. The tradition of giving gifts of jewelry containing these stones dates back thousands of years. The gemstone, or birthstone Sapphire is believed to conduct the energies of the planet Mercury with which it is sympathetic and that wearing jewelry containing the gemstone will focus the energies of the planet and sign through the gem. 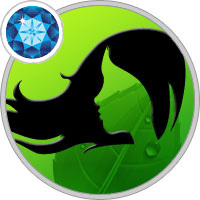 Virgo people are analytical and organized, and Virgo birthstone have been identified of old. These Virgo birthstones act as charm or lucky stone for Virgo, mostly to complement the earthy Virgo nature with emotional and spiritual strength. Do you know the different lucky stones for Virgo? Here is a list of Virgo gemstones. In Virgo, reason transforms itself into wisdom. The birthstone of this zodiac sign is sapphire where the power lies in the rays it emits. Knowledge and understanding produce wisdom. It is reason that alone deals with the externals and wisdom involves the ideal functioning and development of the inner heart. Since it is not possible to reach the state of illumination through reason alone; sapphire comes in to play its part in making the wearer wise. Sapphire is the birthstone for August in the Ayurvedic or ancient Indian calendar, as well as the modern birthstone for September in the Western calendar. This gemstone for Virgo is a variety of corundum, the second hardest mineral, which occurs in various colors, including red, with which the mineral is called ruby. Sapphire that is the birthstone for Virgo is specifically identified as the blue sapphire. This Virgo birthstone is believed to fight depression, and bring inner peace and spiritual enlightenment. The blue colour of the stone is very powerful and important. It is the colour of the sky, the colour of the heavens. Sapphire is considered to be the highest light of all blue stones. This gem which is a matter from the earth has the potential to transform into a blue ray as it spiritualises and cleanses and heals. The deep penetrating light of Sapphire emits the rays of pure devotion that effectively translates into cosmic infinity, the higher mystery and infinite reality. It has the power to transform and to lift the soul of the wearer into the higher realms. This is why sapphire has been used in the performance of higher mysteries. Its sacred beauty inspires religious devotion along with inner devotion and faith. On a spiritual level, sapphire is an excellent meditation tool that has been used by yogis, healers and saints since ages. Sapphire helps the Virgo to develop its existing positive faculties and curb the negative ones. It can effectively enhance the sincerity aspect of the Virgo. As the person becomes more sincere, he is simultaneously drawn towards the truth and becomes more constant in his approach. This helps him to improve in his career and personal and professional relationships. Sapphire helps the Virgo to make its ruling planet Mercury conducive towards them by channelising all the positive energies of the planet in to their lives. It makes the planet sympathetic towards the wearer. Sapphire is very effective on the throat center, which is the center of purity, where thoughts and words are also cleansed. The throat is the gateway to the spiritual aspect of our being, our devotional and mystical nature. Dealing with persistent high temperatures. Prevention and healing of cancer and burns. The birthstone also enhances the analytical qualities in the Virgo and he is able to interpret situations with more clarity. He also becomes more clairvoyant thereby finds it easy to attain mental and spiritual peace. Besides being identified specifically as zodiac stone for Virgo, both in Western and Hindu astrology, carnelian is the traditional birthstone for the month of August in the ancient Hebrew, Italian and Roman calendar, as well as the month of July in the old Arabic calendar. This Virgo birthstone is a translucent red variety of chalcedony. Though the birthstone for Virgo may occur in hues so deep and cloudy as to be nearly opaque, carnelian is always translucent around the edges. A darker red variety of this Virgo gemstone is called sard. It’s not always easy to tell carnelian from sard; hence the names carnelian and sard have become interchangeable. The Virgo stone is believed to fuel passion and desire: something that may be quite helpful to the analytical, less emotional, Virgo. Zircon is the talismanic stone for Virgo. Talismans are amulets or other pieces of jewelry believed to bestow its wearer magical powers. Virgo talisman is engraved on zircon. This Virgo birthstone is a transparent gemstone closely resembling diamond and occurring in various colors, including blue, red, green, yellow and black. The Virgo stone is believed to bring peace of mind and prosperity. Commonly thought to be green stones, jade consists of two chemically unrelated minerals: jadeite and nephrite. Green jadeite is among the most expensive of gemstones, while the green variety of the other Virgo stone is thought inferior in quality, though yellow and white nephrite fetch relatively higher prices. Virgo birthstone of either type of jade symbolizes love and virtue. The Virgo gemstone is also believed to enhance body strength, keeping the often physically active Virgo going, as well as extend longevity. Jasper is a birthstone for Virgo that the zodiac sign shares with Aries, though the main birthstone for the latter is identified to be jasper’s close cousin, bloodstone, which is a green variety of chalcedony speckled with red jasper. This Virgo stone is an opaque chalcedony occurring in many colors, including green, yellow, white and black. The Virgo birthstone is believed to balance negative and positive energy, helping to stabilize its wearer spiritually, while a specific variety of the Virgo gemstone called poppy jasper is thought to bring joy. While also assigned to Aquarius, moss agate is another Virgo birthstone. Due to the lack of actual banding, this Virgo gemstone is not strictly an agate, but a variety of white chalcedony with green moss-like inclusions, hence the name moss agate. The Virgo stone is believed to bring calm and focus, and is indeed helpful to Virgo people, whose mutable sign makes them apt to be nervous, and liable to find themselves lost in details.